The discovery of a new species is always a big deal, especially when it’s been living right under the noses of over 8 million residents of New York City and the surrounding counties. A new species of leopard frog, still unnamed, was first identified by Jeremy A. Fienberg of Rutgers University in 2009 on Staten Island, and DNA tests confirmed his discovery in 2012. It’s no mystery how this mystery frog escaped our notice for so long. There are over a dozen leopard frog species that range between Canada and Central America, and until Fienberg recognized their distinctly different vocalizations, all the leopard frogs of NY were presumed to be either northern leopard frogs (Rana pipiens), or southern leopard frogs (R. sphenocephala). New York State Parks is collaborating with the NY Natural Heritage Program on a regional study aimed at defining the range of the newly described species in comparison to the northern and southern leopard frog. The study’s objectives are to define the distribution, habitat use, and conservation status of the three species from Rhode Island through Virginia by matching calling surveys with follow-up surveys to catch, photograph, and get tissue samples from frogs. In New York, efforts are focusing on the Hudson Valley and Long Island, where State Parks contain some large wetlands that may be suitable as leopard frog habitat. 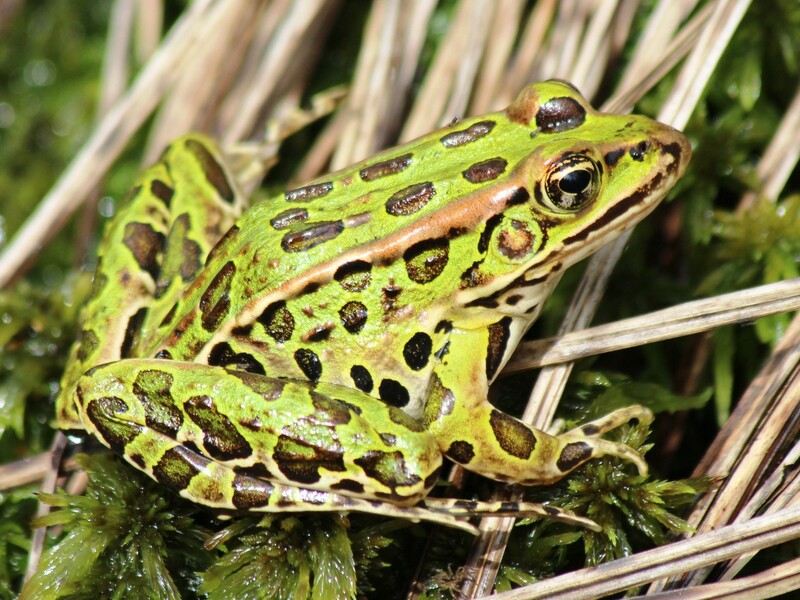 As part of this project, Natural Heritage biologists Kelly Perkins, Rich Ring, and Matt Schlesinger, and Parks biologist Jesse Jaycox, conducted surveys and habitat assessments for leopard frogs at wetlands in state parks. 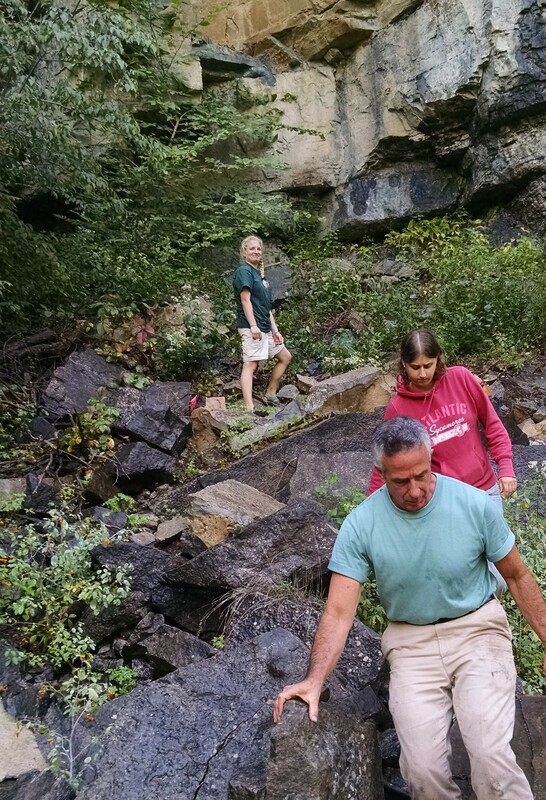 These surveys were conducted at Goose Pond Mountain, Tallman Mountain, Franklin D. Roosevelt, and Taconic State Parks. Despite spending long evenings in the parks at night, when frogs are most active, no leopard frogs were found. However, these wetlands are home to many other types of frogs, including Green Frogs (R. clamitans), spring peepers (Pseudacris crucifer), wood frogs (R. sylvatica), and pickerel frogs (R. Palustris). For now, this new species remains a cryptic member of New York’s natural wildlife. Hopefully, we’ll get to know it better in the future. The featured image is the unnamed species of leopard frog, by Matt Schlesinger. Post by Matt Schlesinger and Paris Harper. Update: The newly discovered leopard frog species has been named the Atlantic coast leopard frog, Rana kauffeldi. NOAA’s Marine Debris Blog has a blog post up on the great work that New York State Parks is doing in Long Island parks to clean up Sandy debris. The featured image is post-storm damage at Jones Beach State Park, by NYS Parks. Need to slow down your fast-paced life? Try watching a snail! No seriously, it’s quite calming. They glide along and seemingly know exactly where they are going. They are curious, and if you listen really carefully, you may hear them munching away when they eat! Cody Gilbertson, a Master’s student of conservation biology at SUNY-ESF, has been working with and watching snails since 2010. On top of that, the species she works with is a small land snail that is also one of the most endangered species of New York. This little snail is quite famous because it is only found at one location in the entire world! 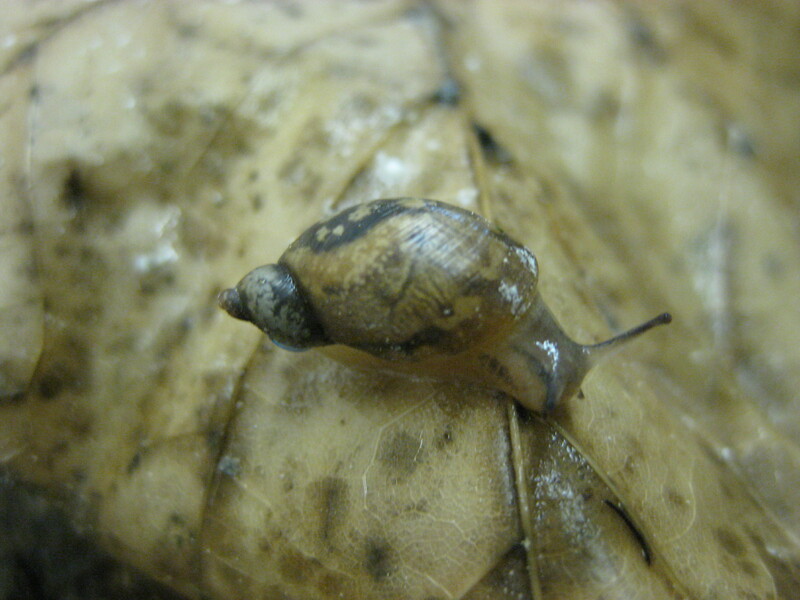 The Chittenango Ovate amber snail resides at Chittenango Falls State Park. At the base of a waterfall 167 feet in height, this unique species goes about its business amongst rocky ledges and lush vegetation. This summer, teams of volunteers signed up to help Gilbertson assess the size of the snail population and contribute data for her research. In these snail surveys, volunteers survey small plots of snail habitat for a set amount of time, capturing small snails in tupperware containers as they go. After the collection, all the captured snails are sorted an identified, so we can figure out which are Chittenango Ovate Amber Snails (affectionately called “Chits”) and which are other snail species. After the count, the Chits are released back where they were found and the other snails are removed. The data from these surveys is part of Gilbertson’s greater study on the life cycle of this rare snail and figuring out what is necessary for their survival. What do they eat? What conditions do they need to survive? How the heck do they live through upstate New York winters? She is looking for new methods to increase this snail’s overall numbers with a goal to help stabilize their population and create a template for other conservation efforts for land snail species. Another important aspect of the project is captive breeding. 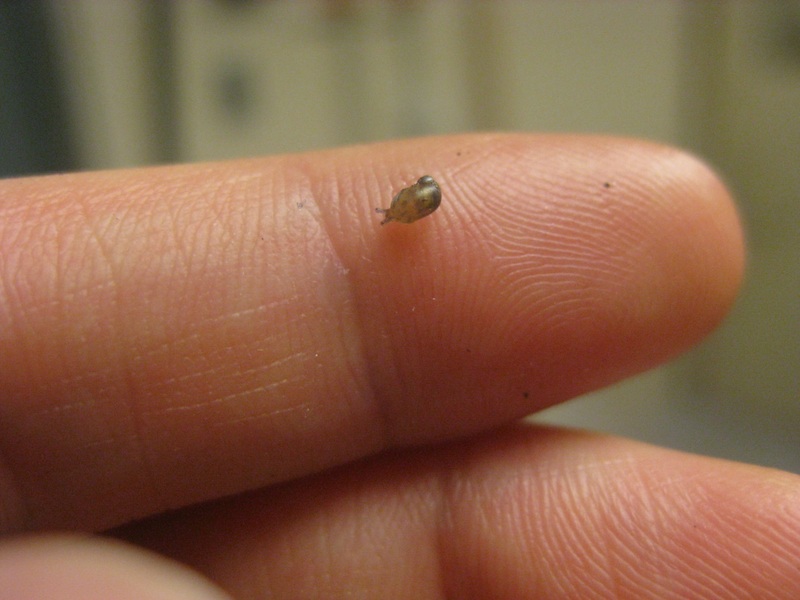 So far, Gilbertson has successfully bred a biologically similar snail species and yielded roughly 3000 hatchlings. She is also looking at how many other snail species live in isolated populations within New York State to find out if isolated populations are common or rare in this family of snails. Not many people slow down to examine the small beings on earth. Some animals may almost be invisible, but they all play a big part in ecosystems and the small size of the animal does not make them less important. So next time you’re feeling rushed in life, take a moment to watch a snail, you’d be amazed at the calm steady creature before you! 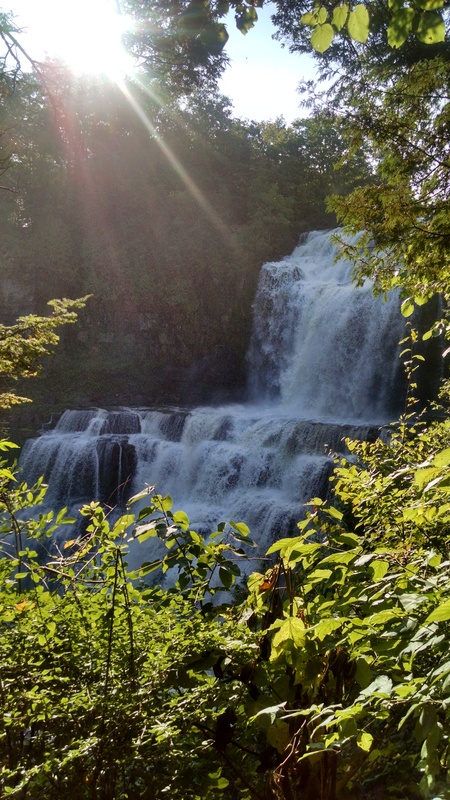 Featured image is of Chittenango Falls at Chittenango Falls State Park, by Paris Harper. 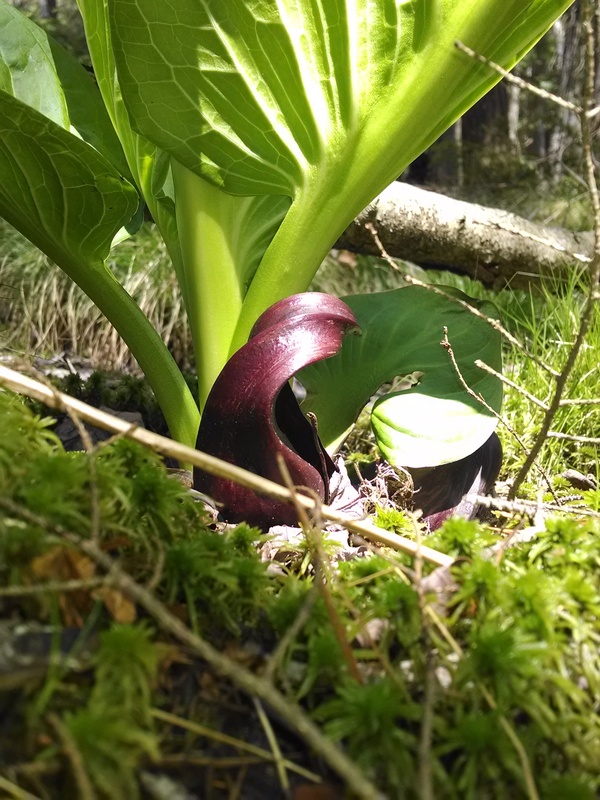 Skunk cabbages grow in the damp peat at the shady, forested edge of the bog. NYS Parks often has to perform a balancing act between meeting the needs of the wildlife and environments, and providing the opportunities for recreation that sometimes negatively impact ecosystems, but also allow people to experience nature and buoy the public interest in maintaining and protecting our parks. Mud Lake, at Robert V. Riddell (RVR) State Park in Delaware County, is a good example of such a place. The NY Natural Heritage program (NYNHP) completed a vegetation map based on field surveys at Robert V. Riddell State Park, and has documented one rare insect species and a high quality dwarf shrub bog, both at Mud Lake. Mud Lake is a very scenic feature in the park, but as park use increases, this fragile ecosystem faces greater risks. For this reason, the Office of Parks, Recreation and Historic Preservation (OPRHP) is looking to provide better visitor access to Mud Lake while protecting the fragile bog and pond habitat. Given that RVR has only recently been designated a state park, there has been relatively little development beyond trail surveys and invasive species removal. Because the park is so close to Hartwick College, one of the most important uses of the park is for education and research, which only adds to the importance of protecting a rare and high-quality ecosystem like Mud Lake. Hartwick College has been a long time partner of State Parks and continues to utilize Robert V. Riddell State Park for educational opportunities. Mud Lake is located on the parcel of land recently acquired from Hartwick College. It’s a small, spring-fed pond surrounded by forest and circled by a narrow band of spruce and tamarack trees, transitioning to low shrubs, and finally to a floating mat of sphagnum peat at the edge of the open water. 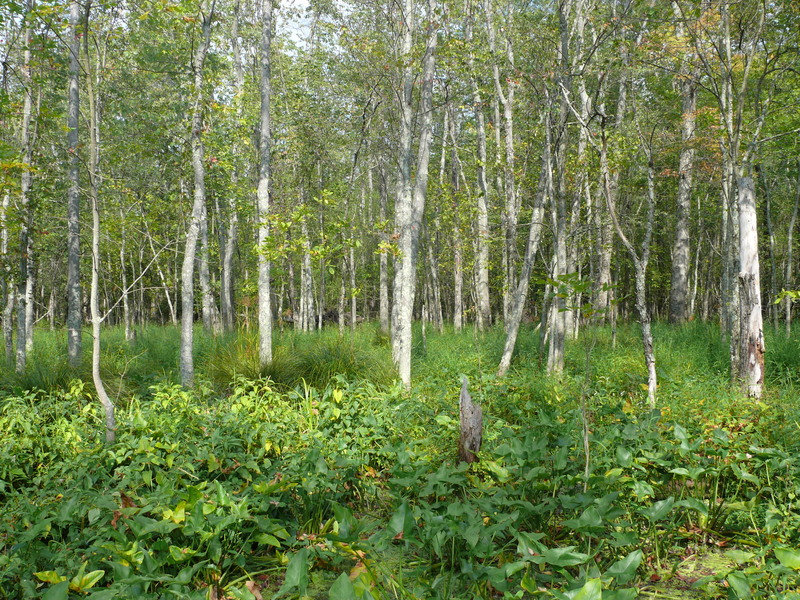 This type of ecosystem is called a dwarf shrub bog, and it is a particularly fragile environment. Wild cranberries only grow in dwarf shrub bogs, as do carnivorous pitcher plants and sundews. These plants can be found growing out of the peat moss. 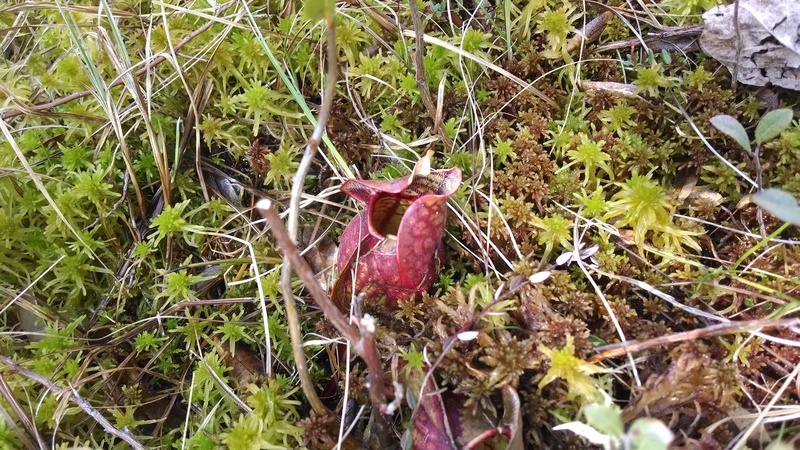 Pitcher plants grow out of peat moss, which is lower in nutrients than regular soil. Pitcher plants capture and digest insects to make up for this! The peat is strong enough to walk on, but the water flowing through the thick vegetative mat gives you the feeling of standing on a waterbed – I was afraid of falling through! 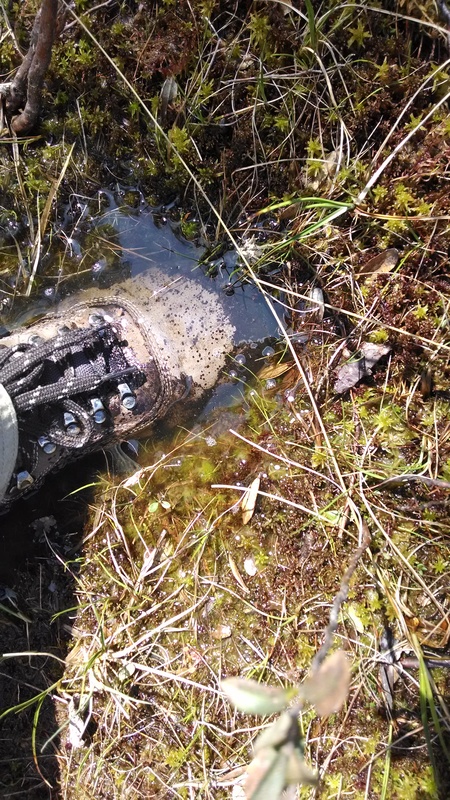 The peat will hold you up, but not without getting your shoes wet! Visitor access to Mud Lake is challenging. Currently, there is no defined pathway that can take you from the edge of the forest out to the open pond and bog area. This means any park visitors that want to get a closer look are making their own paths through the edge of the bog, and putting fragile plants at risk of being crushed. To protect Mud Lake and also to enhance visitor experiences, OPRHP is in the process of designing a boardwalk from the upland edge of the bog to the water’s edge, including a gathering space where groups of students and other visitors can be brought to view the bog. However, building a solid structure on a bog presents unique challenges. Last winter, core samples taken from the peat went as far as 27 feet deep and still did not hit hard earth. At the tree line, solid ground was 20 feet below the surface of the soft, damp peat layer. 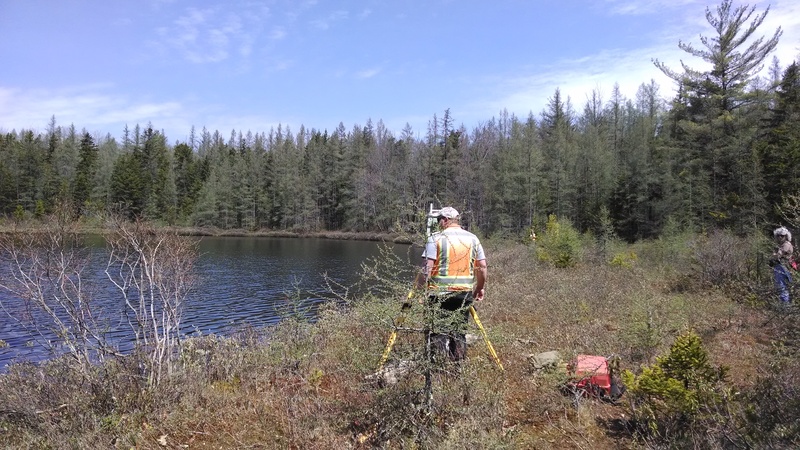 OPRHP is still working on resolving all the construction challenges in this project, but we are hard at work to protect Mud Lake. The bee fly is an adorable insect which can be seen buzzing around wildflowers in spring and summer. The one in this photo was seen near the shoreline at Harriman State Park. Bee flies are named for their round, fuzzy bodies and habit of flying from flower to flower in search of food. Unlike bees, however, these flies don’t sting! That long nose is called a proboscis, and it serves the same function as a hummingbird’s beak, allowing the bee fly to sip nectar from flowers. But as cute and harmless as the adult bee flies are, they start their lives as ferocious little larva! 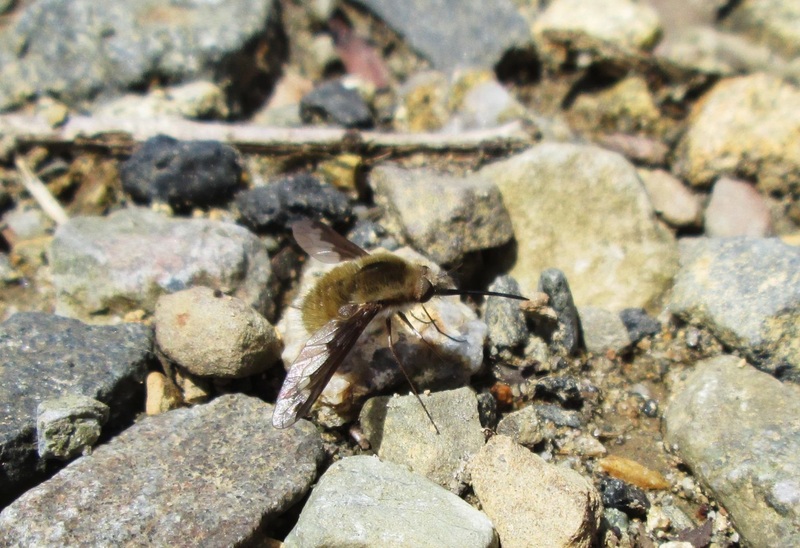 Bee Flies lay their eggs in the same burrows solitary bees dig for their own eggs. When the fly larvae hatch, they eat the bee’s winter cache of pollen, and then they eat the baby bees, too!